I love a fabulous holiday sparkly shoe on a 5″ heel like no other girl. But as we embark on party season, I have made a discovery that makes it even MORE fun. Have you ever been at a party with excrutiating foot pain, running for a cab in stilettos, wishing you were home in your fuzzy socks? I have a gorgeous solution! These shoes, by Jamie Kreitman, are GENIUS. 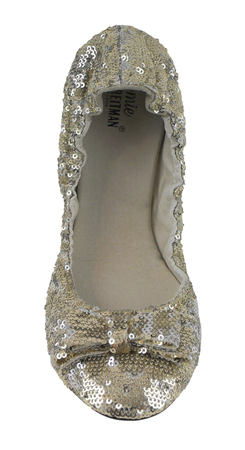 They are gorgeous, embellished ballet flats (a la Miu Miu, but without the hefty price tag) that fold up, come in their own pouch and can fit in your purse. Steathily, you can change into them at a party, or between parties and they will STILL complement your LBD or sparkly tee and jeans. Now, where to stash the high heels? Better bring more than a tiny clutch. Order here. And check out the other styles! Posted in fabulous, parties, weddings and tagged holidays, Jamie Kreitman, shoes. Bookmark the permalink.